World Scientific Publishing Company, 9789814713221, 200pp. In 1981 Mary K Gaillard became the first woman on the physics faculty at the University of California at Berkeley. Her career as a theoretical physicist spanned the period from the inception -- in the late 1960s and early 1970s -- of what is now known as the Standard Model of particle physics and its experimental confirmation, culminating with the discovery of the Higgs particle in 2012. 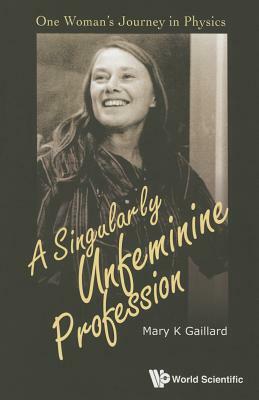 A Singularly Unfeminine Profession recounts Gaillard's experiences as a woman in a very male-dominated field, while tracing the development of the Standard Model as she witnessed it and participated in it. The generally nurturing environment of her childhood and college years, as well as experiences as an undergraduate in particle physics laboratories and as a graduate student at Columbia University -- which cemented her passion for particle physics -- left her unprepared for the difficulties that she confronted as a second year graduate student in Paris, and later at CERN, another particle physics laboratory near Geneva, Switzerland. The development of the Standard Model, as well as attempts to go beyond it and aspects of early universe physics, are described through the lens of Gaillard's own work, in a language written for a lay audience.